To be like a pro spencerian calligrapher now is easier with The WEDDING Script. The Wedding script is a high-quality font-family with more then 2000 glyphs. It is imitating original zanerian style with numerous swashes and swirls. It is very easy to use. Activate contextual alternate, type any number after a letter and get your alternate: W1, W2, W3 etc... Capital letters have 7-8 options. My dream was to create a script that can imitate professional handwriting without efforts! Don't stop creativity process and just type numbers after letters. It is fast and easy. You can see results instantly as a real calligrapher does! 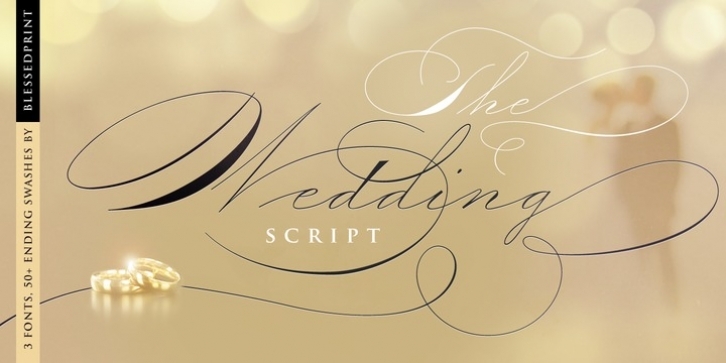 Watch how The Wedding Script works in Photoshop: type your text and start playing! You'll find more then 50 elegant swashes.